My friends at Urban Turf recently posted an article about the apparent strength in sales of units costing more than $1MM. Having spoken to several real estate agents, they asked me for my take. While realtor anecdotes make for good copy, I trust data better. And the data confirm the anecdotes. 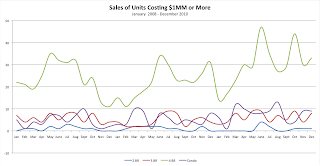 Although the idiots on Wall Street took us to the edge of total economic collapse and consequently froze the real estate market in in 2008, sales of units costing more than $1MM have been doing well for the the past three years. There's no disputing there was a bump in late 2008 when the Bagatelle-brunching morons made Treasury officials break down into tears, but generally unit sales in that stratospheric price level have been steady [refer to the chart below]. Overall, total unit sales in 2010 were up 33.75% YoY, after falling 4.99% in 2009. Condo sales in 2010 were 47.6% higher than 2009, which were 16.7% higher than 2009. Or, 2010 unit sales were 72.2% higher than 2008. The average monthly sales were 8 units. Homes with 4 or more bedrooms ruled. In each of the three years, these units comprised about 67% of units sold. While unit sales fell 5.6% in 2009 YoY, 2010 sales were up 32.6% in 2010 YoY and 25.2% higher when compared to 2008. In 2010, 30 units were sold on average each month. 2010 was a good year for 3 bedroom units. After an awful 2009 when unit sales fell 21.7% YoY, 2010 unit sales rose 38.9% YoY. Average monthly sales were about 7 units. Unlike its price "peers", units with 2 bedrooms or less have not had a good time. 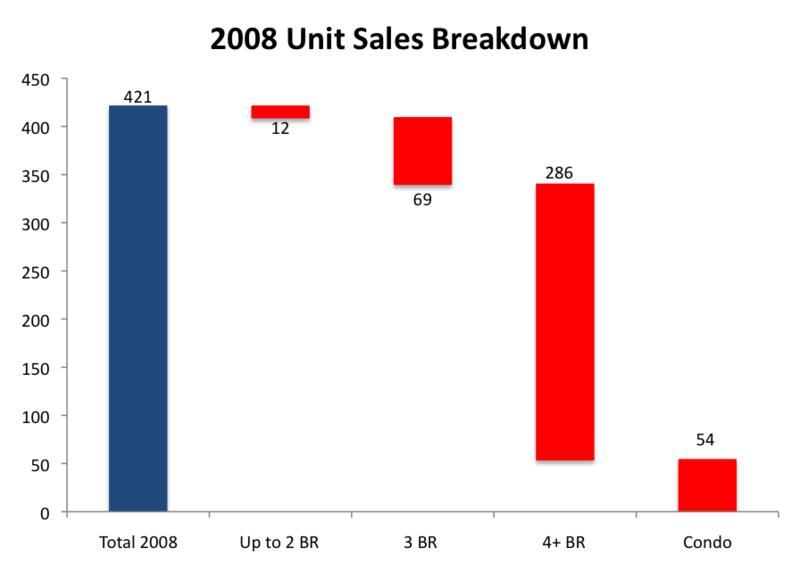 Interestingly, unit sales actually grew 8.3% YoY in 2009. In 2010, unit sales fell 30.8% and are about 25% less than 2008. 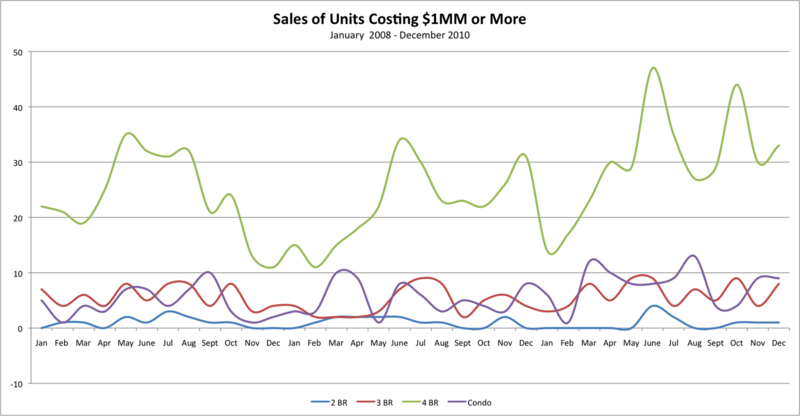 The charts below depict each year's sales for units costing $1MM or more.